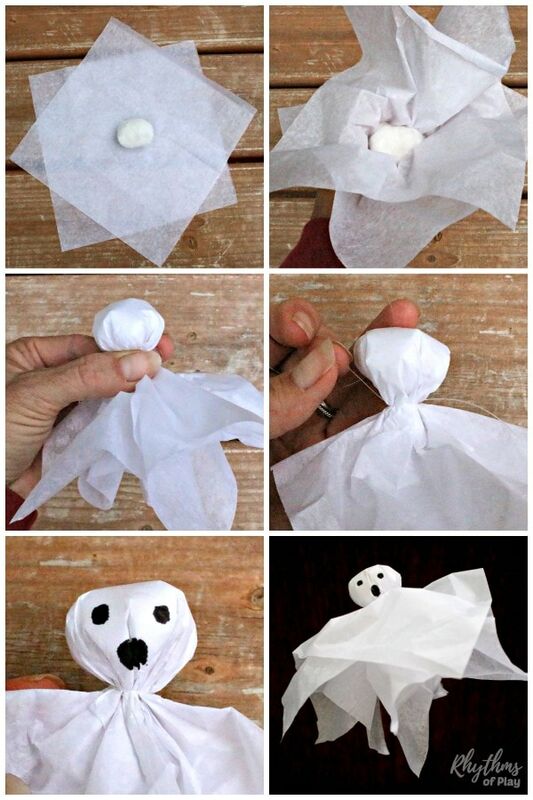 Making a Halloween ghost out of tissue paper, a plastic bag or an old sheet is a classic Halloween craft for both kids and adults. 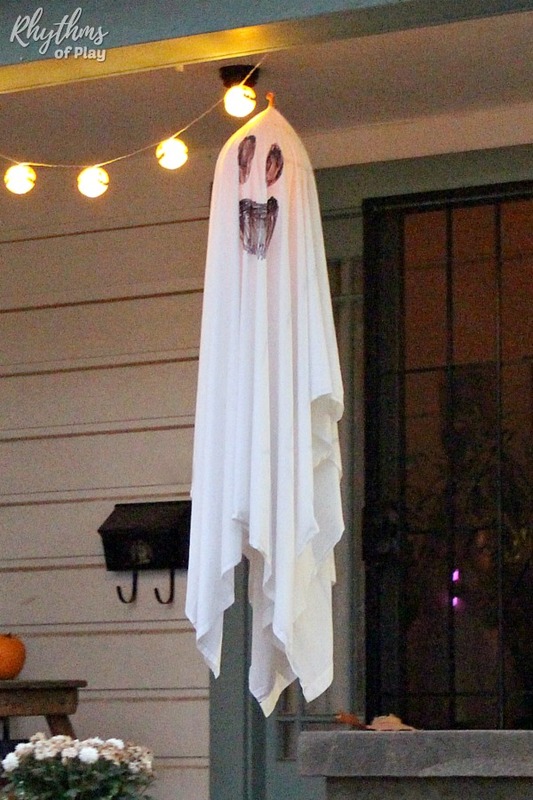 This Halloween ghost craft is also an easy DIY Halloween ghost decoration that can be made in any size from super small to extra large for an indoor or outdoor use. Even toddlers and preschoolers will have fun making Halloween ghosts! This Halloween ghost craft is an easy Halloween decoration that the whole family can make together. All you need is about 20 minutes and a few supplies you probably already have laying around the house. 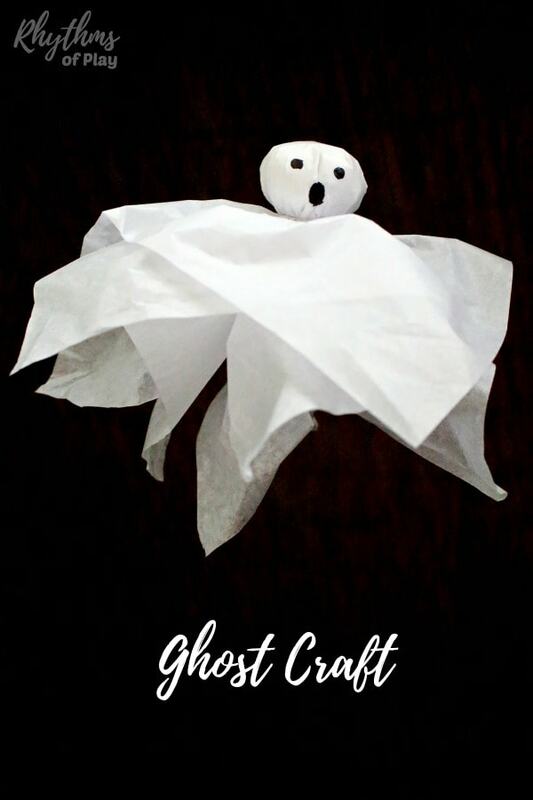 Make this ghost craft and DIY ghost Halloween decoration in any size from small to extra large with recycled tissue paper, white plastic bags, or an old white sheet! For small to medium ghosts use the small to medium ghost craft step by step directions. If you would like to make an extra large ghost, use the extra large DIY Halloween decoration step by step directions listed below. Related: Halloween Art Projects Kids LOVE! Also, see the Halloween ghost decoration step by step photo tutorial below. You can use any size square you would like. We liked making ghosts that were 10 to 12-inch squares the best, but it really depends on how you will be using them. When you use small squares the little ghosts can sit on a table top. Experiment to find the perfect size ghost for your purposes. You may decide to make ghosts of several different sizes. Don’t worry about making perfect squares, the sloppy ones just add to the ghostly appeal. Offset the tissue paper squares so that eight points are showing (see step by step photo collage tutorial below). There are many other materials you can use in place of a cotton ball. Crumpled recycled paper, old socks and old cloth scraps also work well. Cut a section of monofilament (fishing) line. One and a half to two feet works well unless you know you will need more. If you won’t be hanging these you can use a shorter strand. Tie it around the neck of your Halloween ghost craft to secure the cotton ball in place and create the head. 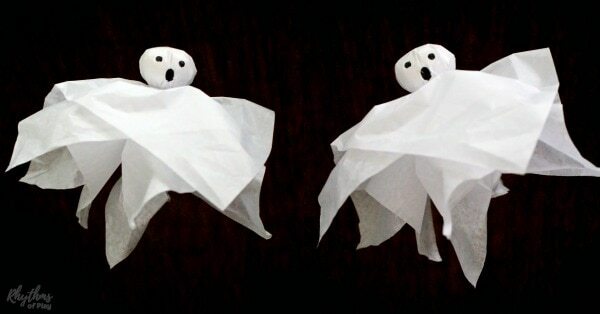 Use a black pen to draw a simple face on each tissue paper ghost craft that you make. Lay the old white sheet out on the ground and pick it up from the center. Cut a very small hole in the center of the old sheet. Find the small hole that you cut in the old sheet and place the knot of the balloon through it. Tie a 1 – 4-foot section of monofilament line of fishing string to the knot on the balloon. Step 5 – Use a permanent marker to draw a friendly or spooky face on your Halloween ghost decoration. Hold the balloon with the sheet over it on your lap and draw a friendly or spooky ghost face on the sheet. Make sure the face will be in the right place when you hang it by holding the ghost decoration from the balloon before you start drawing. Tie monofilament line to a small nail, a tack, the branch of a tree, a flagpole or anywhere else that your DIY ghost decoration can be hung. 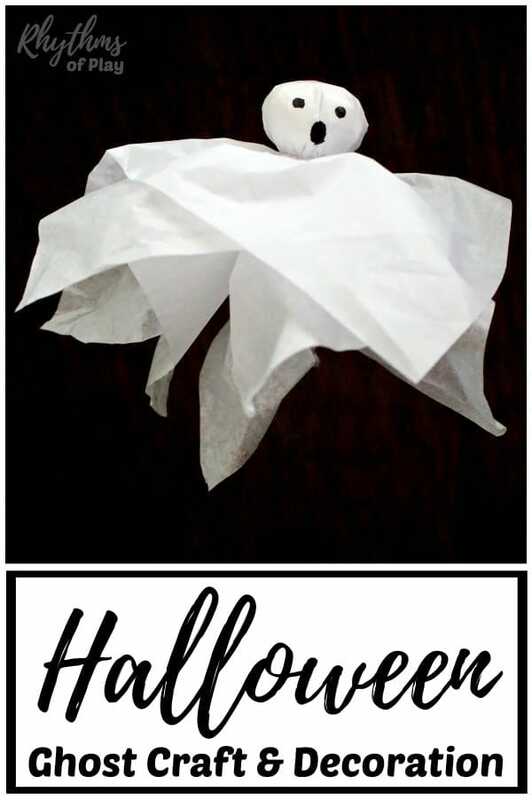 Making ghosts out of tissue paper, plastic bags or an old sheet is a classic Halloween craft and decoration for both kids and adults. Make this DIY Halloween ghost decoration with the kids for some ghostly fun! My daughter likes to use the Halloween ghosts that she makes for imaginative play as she flies them around the house, while I like to use them to decorate our trees, ceilings, and windows for Halloween parties and on Halloween night. For more Halloween fun check out this collection of Halloween Art Projects Kids LOVE! You may also like this collection of gorgeous glowing Halloween lanterns and luminaries. And don’t forget to pop over to have a look at our fall bucket list for the best Autumn EVER! « How to Make Pumpkin Puree the Easy Way!